Home » Family businesses 25 years after the Velvet Revolution – what next? Family businesses 25 years after the Velvet Revolution – what next? Family businesses are the backbone of the global economy. According to recent studies, family enterprises create 70-90% of global GDP, have, on the average, 6.65% higher return on assets and in general comprise 80-98% of businesses in democratic countries. As much as 35% of the Fortune 500 companies comprise businesses classified as family (i.e. one or more family members with a controlling interest in the business and directly or indirectly participating in the management of the firm). Globally renowned family businesses include brands such as Mars, Volkswagen, ArcelorMittal, Walmart, Levi Straus, and DuPont. Family enterprises often constitute a stable and very traditional form of business and some have been around for hundreds of years (the world’s oldest family business is Hoshi Ryokan, a Japanese hotel founded in 718). Unfortunately, the tradition of family businesses in the Czech Republic (Czechoslovakia) was broken by many years of a planned economy prohibiting any form of enterprise. Yet some brands have survived state ownership and continue their family tradition, such as Baťa, Koh-i-noor, Petrof and Kanzelsberger. Family businesses currently make up 40% of Czech GDP, and their share and importance in the market keep increasing. According to AMSP surveys, Czech family businesses are concentrated in the food and construction industries. A specific feature of family businesses is that usually they are not established by their owners for immediate profit maximisation; instead, the founders have a long-term objective to ensure the development of the company and make sure that the entire family will be financially secure. It is due to prudence and conservative approaches that family businesses are in very good financial health and the vast majority of owners plan to pass their firm on to the next generations. The generational transition from the “founding father” to one of his descendants is one of the biggest risks in the history of each family enterprise. Most businesses were established after 1989 and therefore do not have a long tradition, and have not yet had to face the pitfalls associated with the generational change in the company management. After 25 years of a market environment, Czech businesses find themselves in a new situation that is hard to manage without risking firm’s stability (and of the family that is often associated with it). So what options do the current owners of flourishing firms have when considering going into well-deserved retirement? The aim of each owner is to transfer the business in a way that ensures that the company will continue its activity as smoothly as possible and will develop further. The attitude of the founders to future direction is affected by numerous factors, with the most important being the current status of the firm and the economic prospects in general, development in the industry and government regulation of the sector. No less important is the personal situation of the founder (life stage/age, family objectives, property/financial targets). Owners usually focus most of their energy and attention on the above external factors that play a crucial role in the period of building the company and subsequent operating stabilisation; the personal situation often takes a back seat until the question of succession and future direction of the company becomes very pressing. While the economic cycle undergoes a more or less regular fluctuation between periods of growth and recession of various lengths and intensity, a company’s development stage depends mainly on the competitive environment in a particular sector, the degree of development and the level of saturation of target markets. An owner’s life situation, which is affected by purely individual personal factors, is usually a key factor triggering the succession issue, and the need to address it. 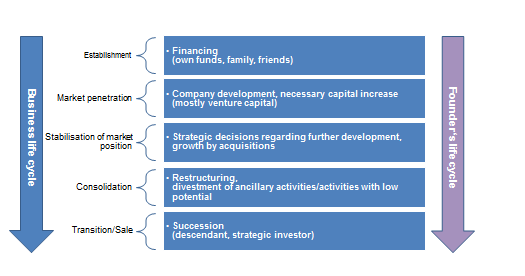 The following chart illustrates the development of a business in association with the transition in the founder’s/owner’s personal and professional life. A factor that is impossible to control but can play an important role in the decision-making on the moment of transition (sale) of the firm is the economic cycle. In periods of development, the successor taking over the business will encounter fewer critical problems that materially affect the firm’s existence. Similarly, a higher selling price can be achieved in a time of growth than in times of stagnation or recession. However, the situation (such as a change in the founder’s/owner’s state of health) does not always make it possible to time the transition for the most convenient moment. Most frequently, family business owners wish to pass the business on to the next generation, traditionally the lineal descendant. Current surveys show that as many as 94% of family business owners believe that they will successfully pass their business to their descendants to continue the family tradition. Despite the strong belief in this scenario, these statistics should be treated with some caution. European data for the last year reveal that 30% of the family firms survive the transition to the second generation, only 12% make it to the third generation, and fewer than 3% of all family businesses live to see transition to the fourth and next generations. Remaining family businesses are either sold or cease to exist. One of the causes of unsuccessful transition also is the reluctance of owners to give up control in time and to find a strategic partner to secure a further continuation of the firm, at least to a limited extent. According to a study carried out by IfM Bonn, the most frequent reasons why business founders procrastinate with succession planning is their inability to leave and give up control of the firm, and their fear of future development (both causes were identified in more than 30% of respondents delaying addressing the succession issue). Another major factor is when business owners do not have any other ways of filling up their time and do not want to devote themselves to any sector other than that where they were active for many years. In addition, they have no other way of spending their free time after the transition. In some cases, the time required for smooth transition of the business is underestimated, and everything is left until the last minute. It should be admitted that cases when the owner makes a timely decision regarding succession are not always as painless as it may look. Most frequent risks encountered by owners handing over their businesses are a lack of interest of their descendants in business, a lack of experience or abilities, or not enough entrepreneurial spirit. However, even in this case, this may be down to the owner, who does not give them the space that they deserve and need in order to develop such skills. More often, it is the older generation that is responsible for the ensuing failure. Another option is the involvement of a strategic investor through the acquisition of a controlling interest. Putting the family enterprise into the hands of an outsider is often painful. 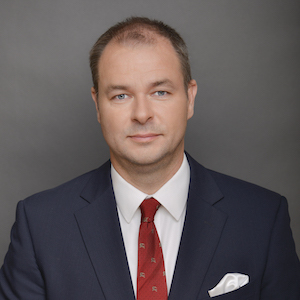 However, there are an increasing number of owners and founders in the Czech Republic who realise that the company has become too much for them to manage, or who wish to do something new but do not have successors that could take over the company management. Finding a strategic investor is a long-term process that entails numerous risks in terms of a wrong choice and consequences of such a decision on the family business. The entry of a financial investor opens up a possibility (which sometimes is a precondition for entry of an investor) for the current owner to continue to participate in the management of the company. In both cases, however, it is a crucial decision regarding future direction of the business, and the final choice depends on many factors. Selecting a suitable investor and form of entry is a complex and time consuming task that cannot always be handled along with the company management. The involvement of an external consultant experienced in a particular sector is therefore an effective solution. Management buyout – yes or no? Management buyouts (“MBOs”) are very popular in the West. This is an option when owners transfer family firm ownership (in whole or in part) to one or more existing managers and then at their sole discretion participate or do not participate in the company operation. MBOs have numerous benefits and advantages that eliminate risks associated with transition to a new owner. If an MBO is agreed between the existing owner and management, the contract is made between two parties that usually know each other very well and have done so for a long time. MBOs are often an arrangement when the current owner in fact prepares a successor among the company management. The advantage of an MBO is that the new owner usually knows the firm very well, has a lot of practical experience of its management and has already been accepted by the employees. This and other facts reduce the risks and costs of the transaction and make the transfer of ownership significantly easier. MOBs also offer a solution where the existing managers are able to timely identify a wrong decision of the owner regarding the transfer of business activities to one of his descendants, who may not be the best candidate. Initiating an MBO process by the management is then one of the options how to save the business from a very bleak future. The period of exit is always a difficult time for owners. All important aspects must be considered and the focus should be on several main points. preparations should begin to ensure the family is ready for changes related to the new life after the transition or sale of the business. At this stage, it is helpful to contact an experienced consultant to discuss the current situation in a particular sector, which is an important fact affecting the fundamental decision of whether to pass the firm on to descendants or to consider a strategic investor as an exit route. In this respect, the consultant may help you to define and sell marginal activities or activities with a low potential, so that the successors could fully concentrate on the firm’s main activity. If a decision is made to sell the firm to an investor that will have the potential to develop the firm further, preparations for the selling process should begin one or two years ahead. In family businesses, the personal consumption of the owner/family is very often interconnected with certain costs of the company, and these two areas should be separated for the sale, so that the investor could clearly see what company costs can be expected after the acquisition. This would facilitate negotiations with investors for the terms of the sale. At this stage, the role of the original owner must be minimised and all corporate processes must be adjusted so that the firm could go on smoothly without the original owner. Operative management as well as established relationships with business partners is handed over. If the family business is sold, it is important to find a suitable buyer and negotiate for best terms of sale as possible. This might be a very exhausting process, where the help of someone with extensive relevant experience could be useful. Prospective buyers often try to take advantage of family businesses’ lack of experience in major transactions, and in the absence of professional support it is very hard for the business owner to act as an equal partner. Once the transition is completed, it is advisable to take time out and a longer holiday or pursue for a while one’s neglected hobbies. This would create a clean break before the new stage of life. If the company is sold, it is wise to think over a strategy related to investments of free cash kept by the original owner. It is often possible to put a wealth of experience to good use as a shareholder or co-investor in other companies, which is not that time-consuming as running your own company and can provide interesting career advancement, use of life-long experience and an opportunity for reasonable appreciation of funds obtained. The team of RSM CZ Corporate Finance has acquired extensive practical experience in finding strategic and financial partners for family businesses and in numerous management buyouts. In advising our clients, we have seen both positive consequences of a correct route selected for transition of family businesses as well as the negative impacts that wrong decisions may have. If you wish to discuss these issues in more detail, we would be pleased to share our experience with you.